January 18, 2017, Berkeley, CA – Today, the animal rights network Direct Action Everywhere (DxE) released an investigation in partnership with 360-degree virtual reality company Condition One into an American Humane Association certified Whole Foods egg supplier. During visits to Sunrise Farms in Petaluma, CA, activists documented rotting bodies, bloody eggs, and hens struggling to walk on wire floors in both cage-free and battery cage barns at the facility - with the cages being illegal under California law. The activists say that the virtual reality footage, viewable and downloadable online, lets the public experience for themselves the “lie” of humane animal products. “Members of the public can now virtually join us in going inside a farm that markets itself as humane and seeing the violent charade that animal agriculture is trying to hide,” said DxE investigator Priya Sawhney. The investigation is being screened by Condition One in a theater in Park City, Utah as part of the Sundance Film Festival. Audience members wear virtual reality headsets for an experience in which they can turn in any direction and see what it looks like to travel inside Sunrise Farms and rescue a bird in distress at the facility. The activists say that the film can profoundly change people by bringing them inside a modern farm. Sunrise Farms produces a million eggs daily and boasts of offering a way to mass produce eggs while keeping animal welfare in mind. The farm supplies Whole Foods Market, which claims not to sell eggs from hens raised in battery cages, cages so small that chickens cannot turn around and open their wings. While visiting Sunrise Farms, however, activists found that while many barns were cage-free, other barns still had battery cages. At all barns, cage-free or caged, activists found rotting bodies, birds struggling to walk, and birds injured from excessive egg production. Activists rescued one bird, named Ava, whose feet were flattened and distorted by the wire cage, and nursed her back to being able to walk. This is the fifth investigation into a Whole Foods farm in recent years and the fourth by DxE. Both 2016 and 2015 saw investigations finding horrific violence at top-rated turkey farms, including the farm supplying the White House on Thanksgiving. 2015 investigations into Whole Foods pork and egg suppliers exposed violence against animals as well. Investigators say repeated misconduct at Whole Foods’ farms shows that “humane” animal products are marketing rather than reality. DxE activists have held demonstrations in over 30 countries and over 160 cities worldwide. Protests are planned for the end of the month at Whole Foods stores around the country. Access DxE’s full press folder, including videos and high resolution photos, here. Direct Action Everywhere (DxE) is a network of animal rights activists across the world. We use creative protest to challenge the use of animals for food, clothing, experimentation, and entertainment. Visit Direct Action Everywhere on Facebook and at http://directactioneverywhere.com/. Follow us on Twitter @DxEverywhere. “Animal agriculture is a horrific industry, and this virtual reality investigation lets people see for themselves that reality truly is terrifying,” said DxE investigator Paul Picklesimer. "Despite years of efforts by animal advocates, California law goes unenforced at Sunrise Farms - showing that as long as animals are objects and not persons in the eyes of the law, they will continue to be abused,” said DxE investigator and former Northwestern law professor Wayne Hsiung. “Animal agriculture is an inherently violent industry, and once again Whole Foods’ humane fraud proves it,” said DxE Investigator Samer Masterson. See a gallery of photos from the investigation below. Click here to download all images as a zip file. For b-roll video, click here. See an infographic on cage-free on caged egg barns here. Direct Action Everywhere (DxE) is a grassroots network of animal rights activists. Starting in the San Francisco Bay Area in late 2013, DxE has since grown to have participating chapters in over 160 cities in 30 different countries. Drawing from the power of the grassroots and groundbreaking social scientific research, DxE uses creative nonviolent protest to challenge speciesism throughout society. 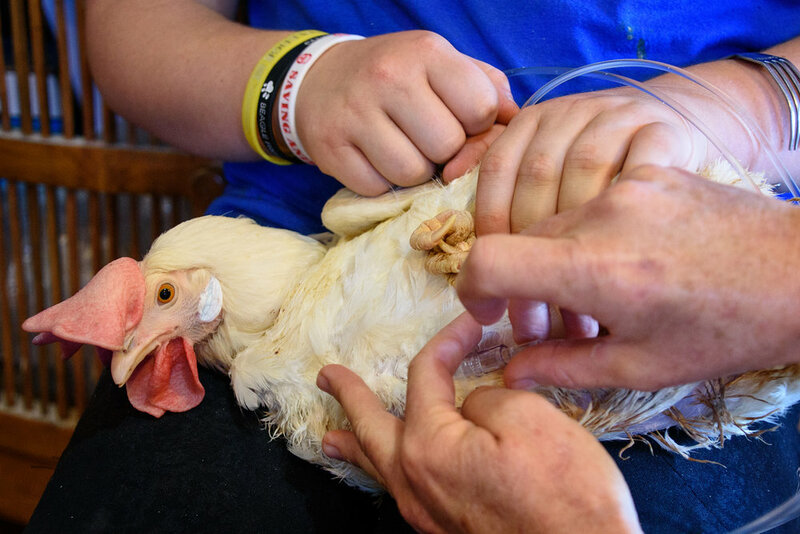 DxE’s Berkeley Animal Rights Center offers a training center for activists to learn about nonviolence, animal rights, and open rescue, a form of investigation in which activists openly enter farms, document conditions, and rescue animals in need. In January, November 2015, and November 2016 DxE released investigations into three of Whole Foods market’s most notable suppliers, including a “Certified Humane” egg farm, the White House’s Thanksgiving turkey supplier, and a turkey facility that was one of only three farms out of Whole Foods’ 2100+ suppliers to receive a 5+ rating on its Global Animal Partnership welfare scheme. The investigations and the ensuing protests around the world received coverage in hundreds of news outlets, including the New York Times, the Wall Street Journal, and the Washington Post. In February, July, and October 2016, DxE released investigations of supposedly humane facilities, including a model egg supplier under California’s Proposition 2, which bans battery cages for hens; a “natural” pork supplier to Costco and the LA Dodgers; and a cage-free Costco supplier. The investigations received media coverage in the New York Times, Washington Post, and Daily Mail, among other outlets. In June 2016, DxE released an investigation into dog meat farms in Yulin, China on ABC’s Nightline. DxE compared the violence against dogs in Yulin to violence against animals on farms in the United States. DxE’s Open Rescue Network provides open-source educational tools and resources to democratize investigatory work. The Open Rescue Network intends to serve as infrastructure for independent, grassroots teams of animal rights investigators around the world. Direct Action Everywhere has been featured in the New York Times, ABC, and the Washington Post among hundreds of other media outlets. See press highlights and a full press archive here. To contact our press team, email press@directactioneverywhere.com.